In excellent condition, this is one of our most popular student stereomicroscopes. Eyepieces x10 wide field with a x2 objective pair gives an overall magnification of x20. Pole coarse focus with a rack and pinion fine focus. Stage clips with a reversible black/white dissection plate. Gillett & Sibert were probably the last of the classic UK made microscope manufacturers to withdraw from microscope production. This is one of their later models and in good condition . Build quality was always a marker of G&S microscopes and this is no exception. Finished in grey enamel with black and chrome controls the microscope is all original apart from the wide field x10 eyepieces which are a recent improvement. Objectives x10 (0.28), x20 phase (0.50). X40 phase (0.70) and a x100 (oil immersion) with a numerical aperture of 1.3. Rheostat controlled halogen illumination. A 6v 20 watt transmitted light base with separate transformer and brightness control. Ideal for use as a back light with any long arm stereomicroscope. Frosted glass plate and two specimen retaining clips. As new. 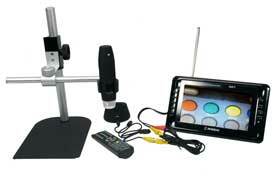 The ideal hand held microscope for the office, workshop or home use. The Desk Top Microscope is a digital system that provides an image directly to a laptop or PC for viewing. 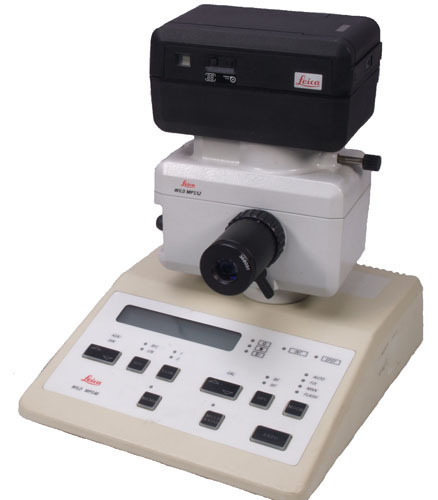 This microscope has a magnification range of x10 to x200 and has in built LED illumination with brightness control. The corded 1.3M unit connects by a USB lead to a USB2 on the laptop or PC and has a polarising filter built in that reduces the ‘glare’ from reflective surfaces. The unit takes still images and video clips with the ability to make measurements on the captured images. Used only by ourselves for customer demonstrations. This is a new stereomicroscope with an inbuilt digital camera that has failed. This in no way detracts from its use as an excellent stereomicroscope. It has a zoom magnification range of x10 to x40 of excellent optical quality. Wide field x10 eyepieces. Rack and pinion stand with both incident and transmitted LED light sources. Both are rheostat brightness controlled. Massive saving of over £360. Sold by our sister company Apex Microscopes, The Learner is one of the most popular microscopes being ideal for the young scientist because it allows both slide examination and also the study of whole objects as well without the need for slide preparation. The microscope has LED lighting which can be operated entirely by battery power. There is a top light form looking at the surface of things and the bottom light fro looking at microscope slides. Objectives x4, x10 and x40 which with the x10 and x20 eyepieces gives a magnification range of x40 to x800. This is one of our most popular microscopes. The current SP60 has undergone a design change which means we have a small number of the Mk1 versions available at an exceptional price. Objectives x4, x10, x40 and x100 (oil) with x10 wide field eyepieces giving a magnification range of x40 to x1000. Full mechanical stage with drop down controls and a substage condenser with lateral movement adjusters. Full Kohler illumination with a 6v 20 watt lighting system. Coaxial coarse and fine focus system. Excellent value. This really is a bargain. The Wilovert is a biological inverted microscope ideal for viewing culture flasks and petri dishes for pond life screening. This particular unit has been well used but still functions which saves it from retirement. It has lost its pre-shaped insert from the stage but the drop down coaxial controls still function perfectly. Objectives x5, x10 and x40 with x10 wide field eyepieces. 6v 20 watt lighting system with rheostat brightness control and iris diaphragm. Binocular head. Used only by ourselves for customer demonstrations this is in effect a new microscope. An ideal instrument for those wanting a microscope that can act as both a biological microscope for studying standard biological slides and also a polarising microscope for geological work. Rotating circular stage, focusing substage condenser with iris diaphragm. Coaxial coarse and fine focus controls. The polarising filter fits over the light source and can be rotated manually and the analyser is fixed underneath the monocular head. Objectives x4, x10 and x40 with a wide field x10 eyepiece. Condition as new and fully guaranteed. This Microzoom unit has been used for customer demonstration and is in excellent condition and fully guaranteed. Normally used in an engineering environment with the output attached to a computer screen this particular unit also has an eyepiece option for direct viewing. In addition it has a Brunel Eyecam included with its software and connection leads. Zoom magnification x7 to x45 with the x10 wide field eyepiece. A bargain. This really is a bargain. One of our ever popular BM1 long arm stereomicroscopes that is missing the lighting system and has only one set of objectives giving an overall magnification of x20. In all other respects this is an unused microscope. Used only by ourselves for customer demonstrations this is effectively a new microscope and fully guaranteed. x1 objective pair with x10 widefield eyepieces giving an overall magnification of x10 which is ideal for micro soldering work of dissection. The flexible light guide delivers bright, heat free LED illumination that can be angled to provide the optimum view. This is actually a new microscope that has suffered an area of paint damage beneath the monocular head on route from the factory. This is quite a small area and is not visible unless the head is removed but nevertheless does not pass out stringent QC tests. Fully guaranteed. Objectives x4, x10, x40 and x100 (oil) with a x10 wide field eyepiece gives a magnification range of x40 to x1000. Mechanical stage with drop down controls and full substage condenser. Coaxial coarse and fine focus and 6v 20 watt halogen illumination system. Grey carrying case.